Your garage offers a convenient place for storage, but the items you keep in there can get damaged during winter due to snow and ice. When snow and ice melts and drips from your car or when you and your family track it on the floor while walking, this puts boxes and other storage items at risk of getting wet. Depending on what you keep in there, you could end up with damaged items that have to be thrown out. 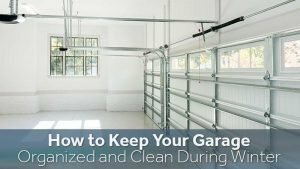 Keep the following tips in mind for keeping your garage floor dry and clean. Ideally, you’ll want to organize your garage so that you don’t have to keep any items on the floor. Take the time to go through everything in your garage, and sort items by type. For example, put sports equipment in one pile, bags of salt or sand in another and tools in another pile. Get rid of any items you don’t need anymore so that they won’t take up room in your garage. When you’ve sorted what you need to store, it’s time to look into storage solutions. Putting in racks or shelving units gives you a place to store items other than on the floor. If you have space in your garage, consider adding a few of these along the walls, so you don’t have to keep boxes and other storage items on the floor. Make sure that shelves are deep enough and sturdy enough to hold larger or heavier items. Get taller shelves and racks, so that you can make the most of the wall space in your garage. Placing a containment or roll out mat on your garage floor helps prevent melted snow and ice from running across it. These mats catch water and moisture, as well as road salt and other debris that’s on your car or boots. Using one of these mats helps protect any items that you store on the floor. When winter is over, you can clean off the mat easily and put it away for next year. If you don’t have enough room to store all of your items off the floor, consider other storage solutions. 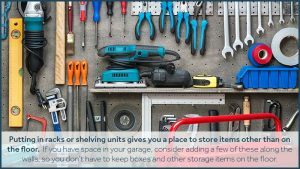 Using portable storage or an on-site storage service frees up space in your garage and gives you a safe and dry place to keep items all winter long instead of the on floor. Zippy Shell offers reliable and affordable storage solutions for homeowners in the Greater Columbus area. Whether you need long-term or short-term storage, you can find a solution that helps protect your items from damage during winter. Contact us at Zippy Shell Greater Columbus for more information on our storage solutions this winter.